Inventory We are a resale marketplace, not a box office or venue. Ticket prices may exceed face value. This site is not owned by Thomas & Mack Center . The Thomas & Mack Center is an arena located on the campus of the University of Nevada, Las Vegas, in Paradise, Nevada, USA. For ring events, the capacity is 19,522, for basketball, the capacity is 18,776. The facility was first opened in the summer of 1983 and underwent a major interior and exterior renovation in 1999. 2008 saw the installation of all new visual equipment, which included a 4-sided new center-hung LED widescreen scoreboard, which includes four LED advertising/scoring boards above it and a LED advertising ring below it to replace the one installed in 1995, a partial LED ring beam display covering 80% of the balcony's rim, a new 50' LED scorer's table display, a new shot clock system for the backboards, six wall-mounted locker room game clocks, two new custom scoreboards with fixed digital scoring and complete player stats and a new outdoor marquee LED video billboard. 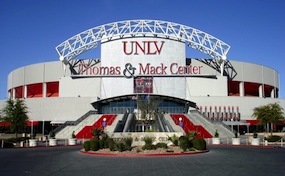 ThomasMack.CenterLasVegas.com is not affiliated with any primary box office or supplier. We are a privately owned and operated business specializing in sales in the secondary market. To buy tickets for any Thomas Mack Center events in Las Vegas simply click on the event of interest or call our operators at anytime.